Iran-backed Hezbollah wins more than half the seats in Lebanon’s elections on Sunday as PM Saad Hariri loses a third of parliament. Follow our coverage. Hezbollah has managed to consolidate its position in Lebanese politics and in the process encroached in Hariri's stronghold of Beirut. A sign that Hariri's lack of political acumen is putting his base in jeopardy. Lebanon’s sectarian-based power-sharing politics mean no single alliance in the 128-seat parliament will enjoy a stable majority and analysts expect a fragile status quo to be preserved. Even though the official results have not been announced yet, Hezbollah's leader Sayyed Hassan Nasrallah says his party has achieved "victory" in Lebanon's first parliamentary elections since 2009. PM Hariri has lost over a third of his seats. Despite losses sustained by his party, Saudi-backed Saad Hariri would still have the largest Sunni bloc in parliament, facilitating his return as prime minister to form the next government. 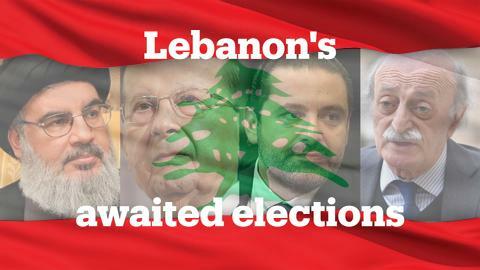 Lebanon is heading towards its first election since 2009. Known as a microcosm of the Middle East, Lebanon continues to reflect greater Saudi-Iranian tensions in the region as the new internal dynamics have started to affect its political balances. Parliamentary elections in Lebanon are finally taking place. But will the new system change anything? A Palestinian seat in the Lebanese parliament? Manal Kortam is running for an 'imaginary seat' in Lebanon's parliament because, as a Palestinian, she'ss ineligible to run. The Western-backed Prime Minister Saad al-Hariri, Lebanon's leading Sunni, is battling to limit losses he is expected to suffer in the first parliamentary election in nine years. He is nevertheless expected to form the next government. Tripoli, is one of Lebanon's Sunni heartlands, it should be an easy win for Prime Minister Saad Hariri and his Future Movement in Sunday's elections. But as Abubakr al Shamahi found out, Hariri has strong opposition ready to take his place. Is Lebanon's electoral system complicated? Lebanon splits power among religious groups where the president is always a Maronite Christian, the prime minister a Sunni Muslim and the parliament speaker a Shia. Can Lebanon's female election candidates bring change? Lebanon's current parliament has a paltry number of female members. But now, 11 percent of the candidates contesting in the first parliamentary elections in a decade are women. Lebanese will have a first opportunity in nine years to vote in a general election, but candidates will mostly be trading on their family name. International donors have pledged $11 billion in financing to Lebanon four weeks before the election. Considering the rampant corruption in the country, it's worth asking if this gives an edge to Lebanon's incumbents. The election is being held under a new proportional system that has confused some voters and made the contest unpredictable in formerly safe seats, but still preserves the country's sectarian power sharing system.